Sometimes, you need a little bit of cleaning in a small spot. Maybe you’ve got a puppy who’s still learning where and when it’s appropriate to take care of business. Maybe you’ve got kids who tromp through mud and layer your carpets with three shades of brown. Maybe you and the spouse sometimes spill a little red wine while you snuggle on the couch. A small, portable spot cleaning carpet cleaner could be the solution you’re looking for on all those little messes. And we’ve got a great one to suggest: the Bissell 3624 SpotCleaner Pro. 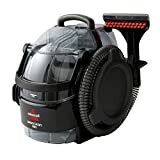 What’s Included with the Bissell 3624? Way back in 1876, a man named Melville Bissell had a crockery shop that he owned and ran with his wife, Anna. And that shop, like all shops, got a bit dusty and dirty from every day existence. This constant need to clean up, and keep the shop clean led Melville Bissell to create the Bissell Carpet Sweeper, which he patented that year. Just a few years later, Mr. Bissell built the first carpet sweeper plant in Grand Rapids, Michigan, and by the 1890s, they were mass producing these sweepers at about 1000 units per day. Those mechanical sweepers opened the door to a world of electrical vacuum cleaners and shampooers, one of which, we’ll examine now. This handy portable carpet cleaner is one of the top rated carpet spot cleaners on the market today. It’s got a lot of great features that make it ideal for keeping the main thoroughfares of your home clear of muddy prints, and quick clean-up of stains and spots easy. First off, we love the size of the Bissell 3624. Weighing in at 13.2 pounds, this little machine is a lot easier to use than a full-size carpet cleaner when you just need some touch up or to attack a nasty spot left behind by Fido. It’s got a three-quarters of a gallon tank, which is pretty impressive for such a small piece, but that extra weight from the tank when it’s full can make it just a little bit awkward, according to some. Of course, what makes a good vacuum and carpet cleaner is the power behind the motor. The Bissell 3624 is considered by many to be one of the most powerful spot cleaner carpet cleaners available. That means it’s going to get the job done on tough, deep, and even set-in stains you’ve been avoiding for a while. The Bissell 3624 is made of durable materials, which is necessary in a portable carpet cleaner. While you never intend to, cleaning up messes in tight corners usually means some bumping around. Since the Bissell 3624 is made up of tough plastic, it’s going to be fine, and usable for a good long time. But, if something does go wrong, there is a 2 year limited warranty offered by Bissell. The Bissell 3624 has a great cord length of twenty-two feet, which means you won’t have to drag out the extra footage of an extension cord. You can move about the room easily with it, and clean up those messes pretty efficiently. Because it’s portable, it’s perfect for cleaning stairs, small area rugs, spills in corners or behind awkward furniture, upholstery and, heck, even the car. And, of course, that large tank makes it easier to use because you don’t have to keep emptying and refilling as you go along. Obviously, if you’re going to use this to clean up a large area, you might have to repeat, but being a portable carpet cleaner, it is designed for the smaller jobs anyway. The Bissell 3624 comes with some great tools for the most effective carpet cleaning possible. The six inch stair tool enables you to go along the stairs and deep clean those nasty mud stains from the dog’s paws. The three inch tough stain tool gives you focused power on particularly difficult stains that normally you’d have to scrub, soak, scrub, wait on, and repeat a few times. The Deep Cleaning Formula from Bissell also comes with the Bissell 3624, in a sample size of eight ounces. Give the cleaner a try, and you’ll see why it’s such an integral part of carpet cleaning. We think that you’re going to love the Bissell 3624 SpotCleaner Pro. It’s got all the features you want in a portable cleaner. 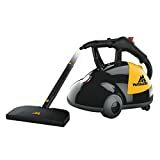 It’s lightweight, easy to maneuver, has a large capacity tank for cleaning, and comes with handy tools to get the job done better than just about anything else. You can take it anywhere, use it on any stain or spot, and then store it away easily, since it takes up very little space. We love this carpet cleaner, and we’re certain you will, too.